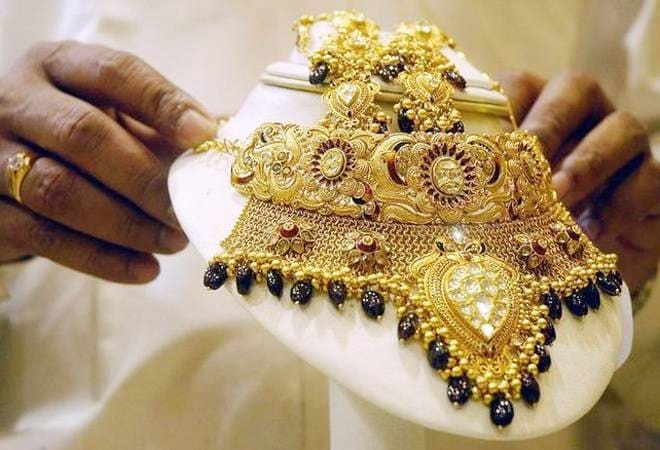 Persistent buying by ornament makers, triggered by upcoming festive and wedding season lifted the gold prices to an almost six-year high of Rs 32,780 per 10 gram. Gold strengthened for the sixth straight week and gathered further grounds to reached 6-year high of Rs 32,780 and ended at Rs 32,650 per 10 gram at the bullion market amid the pick-up in buying activity ahead of Diwali. Silver, however, lacked necessary buying support and shed some grounds. Bullion traders said persistent buying by ornament makers, triggered by upcoming festive and wedding season lifted the gold prices to trade at an almost six-year high of Rs 32,780 per 10 gram. Globally, gold after moving both ways ended the week a shade lower at USD 1,233.20 an ounce as against previous week's level of USD 1,233.80. Silver too ended almost flat at USD 14.82 an ounce. In the national capital, gold of 99.9 per cent and 99.5 per cent purity commenced the week steady at Rs 32,550 and Rs 32,400 per ten gram, respectively on scattered support. Later, on pick-up in buying activity, driven by upcoming festivals, it surged to trade at near six-year high of Rs 32,780 and Rs 32,630 per ten gram and finally settled Rs 100 each higher at Rs 32,650 and Rs 32,500. This is the highest level since November 29, 2012, when the precious metal had closed at Rs 32,940. In contrast, silver ready after shuttling both ways on alternate bouts of buying and selling, finally ended the week Rs 70 down at Rs 39,530 per kg but silver weekly-based delivered managed to close Rs 110 higher at Rs 38,820 per kg on speculative activity. On the other hand, silver coins strengthened by Rs 1,000 to Rs 76,000 for buying and Rs 77,000 for selling of 100 pieces on increased demand ahead of Diwali.